Whether you know it or not, Texas is one of the most important states in the union. If trucking is the backbone of America, then Texas is the backbone of trucking. Don’t believe me? Here are a few stats you should see. According to the 2013 State Transportation Statistics Report, Texas has 2,284,691 registered trailers and semi-trailers. That’s second only to California. The state of Texas employs the most drivers of all the 50 states. In May 2014, they employed around 165,000 total. There were 6,879 general and specialized freight trucking firms in Texas in 2013. For recruiters in Texas, these statistics can be problematic. The driver shortage is taking its toll and competition is getting fierce. 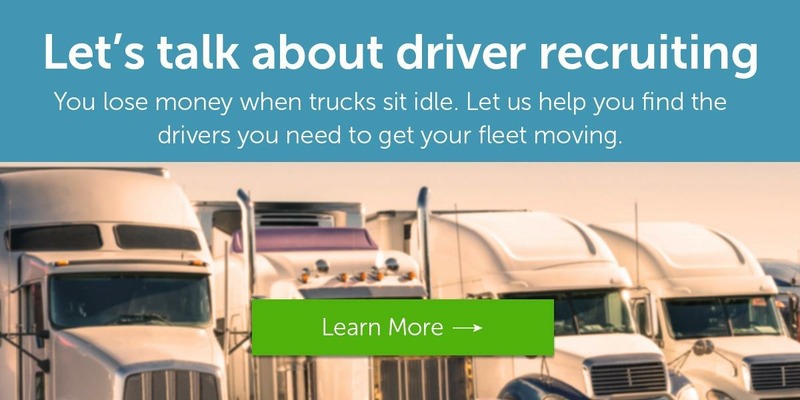 More and more trucks are sitting idle in your terminals because you can’t find the local drivers your fleet needs to keep freight moving. Of the many channels you are utilizing to accomplish your recruiting goals, print and signage aren’t the most high tech. Actually, they’re the same channels that your father or grandfather would have used. But that doesn’t mean they’re worthless. Print and signage are the foundation for a solid driver recruiting strategy. Marketers will tell you that the first step to targeting very specific, highly qualified drivers is to find out more about them. Who are they? What do they do? What are they interested in? Where do they spend their time? Fortunately, you already know a lot about truck drivers. This will help you target drivers who are specifically working in Texas. For instance, you probably know that truck stops are a “social hub” for truckers. You may not know that the average trucker spend an estimated 185 hours a month in truck stops. It’s also estimated that around 1600 active drivers enter truck stops on a daily basis. Signage placed in truck stops are noticeable and eye-catching. It can help keep your brand and benefits top-of-mind as drivers carry their load through Texas. Print is a valuable source of information for all types of drivers. By using niche-driver brands and truck stop distribution, you can keep your print ads targeted to Texas and the southwest. Truck stops are one of the best places to target Texas’ large driver population. If you want to read more about building a strong truck stop strategy, here’s the perfect article for you. We talk a lot about incorporating digital into your driver recruiting campaigns. And with good reason. Digital advertising is one of the best ways to guarantee that your ads are getting in front of very specific drivers. You can use a number of targeting options to advertise to truck drivers in the Lone Star state. One of the biggest opportunities available to fleets are tagged audiences. As drivers visit websites, they can be tagged by a cookie. This tag will allow you to get in front of very specific drivers when you’re building online ads ads. Thanks to Randall-Reilly’s various media properties, we can use our large audience of owner-operators and company drivers to help you target your ads. Display your ads to drivers closest to your terminals. Layering additional targeting options on top of your tagged audience can help you narrow down these drivers to specific geographic areas. You can do this on many sites, including Facebook, Google, and YouTube. This will allow you to serve ads specifically to drivers in Texas. You can even narrow down to key cities near your terminals, like Dallas, Houston, or El Paso. “Events” is a broad category. They range from big trade shows to intimate, networking events like the CCJ Fall Symposium. But for driver recruiters who need to accomplish measurable hiring goals in Texas, shows like the Great American Trucking Show are a big opportunity. Drivers have a lonely, isolated career. They spend hours sitting in the cab of a truck with limited creature comforts. Some can even go weeks or months without seeing their families and friends. Large trade shows can offer drivers opportunities to learn about the future of the trucking industry and catch up with old friends. It’s like a family reunion. 68% of the total attendees to GATS were from Texas. The next biggest concentrations were from Oklahoma, Louisiana, and Arkansas. 59% of attendees at GATS were either owner-operators and company drivers. Trade shows provide you with something that you can’t get anywhere else: face time with drivers who are looking for new, local positions. You get to have real conversations with real drivers. You’re not just a big fleet that might can offer a little more money or a sign on bonus. Exhibiting at an event gives your fleet a face and a story, something drivers want. The driver shortage is putting you under a lot of pressure. Compounding the shortage is the need to generate geographically specific driver applications. But that doesn’t have to be a barrier for your fleet’s growth.